Want it on Saturday, 27th April? Place your order within 21 hrs 6 mins and select Saturday Delivery at the checkout. These kits contain high quality ceramic pieces (which simulate the stones and the original materials), cardboard structure, glue, scenic material, and instructions. Aedes Ars produce a wide range of building sets which are used for the scale reproduction of some historical monuments such as castles, churches, bridges, and lighthouses, (some are recognised World Heritage Sites), as well as diverse miniature buildings of typical country constructions. 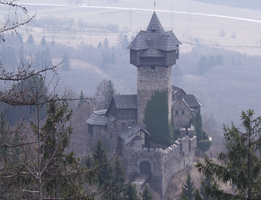 Falkenstein Castle is in Austria, in the Carinthia County close to the city of Obervellach in the Möll Valley. It was built in the 11th century, and in 1164 appeared castle references in some documents. Today it is divided into two castles located on the same mountain, one of them 600 feet from the other. The highest one is a ruin with a chapel still in use, the chapel of John the Baptist. The other castle is restored but currently uninhabited. It was designed to gain access from the east for defensive purposes. The castle has changed hands several times over the centuries. At the beginning of this century the current owner began a big restoration project.